HSSC results: The candidates can check the results on the official website. 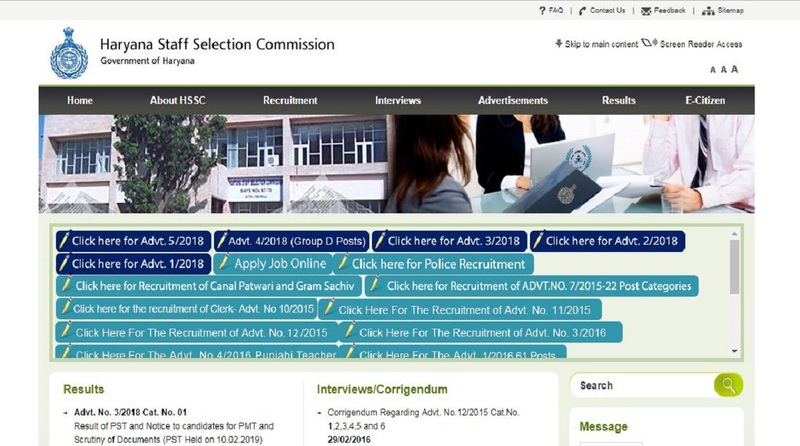 HSSC results: Haryana Staff Selection Commission has released the Physical Screening Test results for the posts of Male Constable. The candidates can check the results on the official website. The results have been released for PST conducted on February 9 and February 10, 2019. The qualified candidates will now appear for in Physical Measurement Test and Document Verification. The candidates are advised to bring the original downloaded copy of admit card of PMT, admit card of scrutiny of Documents, all original documents, one set of self-attested copies of all documents, one self-attested copy of downloaded application form. If a candidate does not appear for the Physical Measurement Test, then no further opportunity will be given thereafter.